February 16, 2018 – When NASA’s Orion spacecraft launches into space atop the agency’s Space Launch System rocket on its first uncrewed integrated flight, Exploration Mission-1, it will travel thousands of miles beyond the Moon and return to Earth for splashdown in the Pacific Ocean. While traveling to deep space, Orion will experience extreme hot and cold temperatures, with re-entry temperatures nearing 5,000 degrees Fahrenheit. NASA and Lockheed Martin engineers in three different areas conducted and monitored the test, including the team in the high bay near the chamber controls, the ground test instrumentation readout area, and the Test and Launch Control Center, where system managers powered on and monitored the crew module’s subsystems. 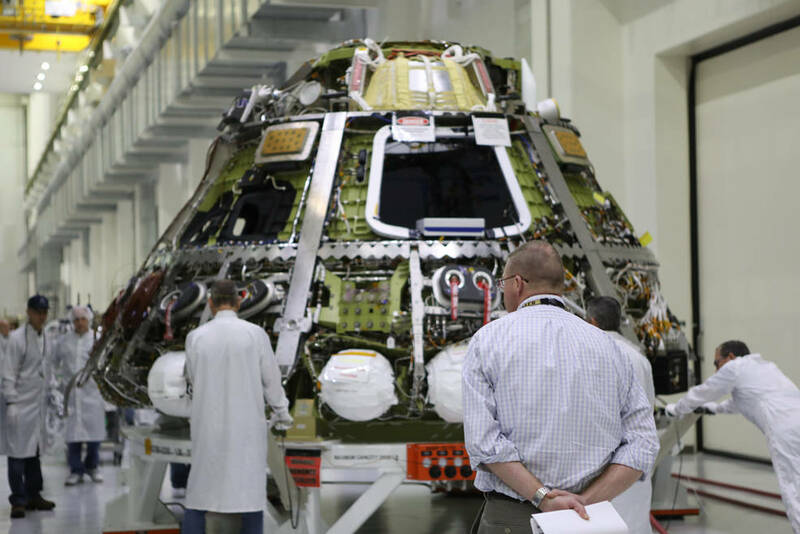 A thermal cycle test of Orion’s integrated crew and service module, along with electromagnetic interference and compatibility testing, is scheduled for early next year at NASA Glenn’s Plum Brook Station in Sandusky, Ohio. While testing at Kennedy helps ensure Orion is ready for EM-1, Plum Brook facilities can simulate more extreme conditions and will help validate the integrated spacecraft design for future missions. The service module is the powerhouse of the spacecraft, providing it with the electricity, propulsion, thermal control, air and water it will need in space. During EM-1, the Orion crew module structure will reach temperatures ranging from minus 300 F to plus 250 F depending on the Sun’s angle on its way to the Moon. “The information from Kennedy testing also will be used to confirm thermal models used to predict temperatures during the mission. It’s the only time the spacecraft will be tested in this way,” said Mark Cavanaugh, the Orion passive thermal control deputy system manager.